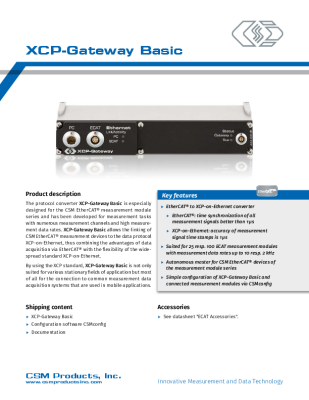 From a software perspective, the XCP-Gateway serves as an XCP controller with numerous measured quantities. The measurement configurations of the connected measurement modules are written to a single A2L file. 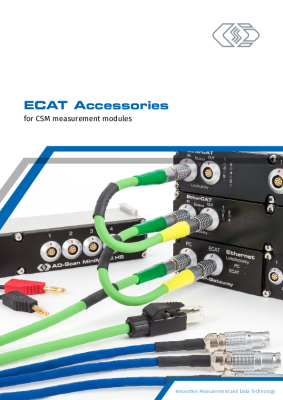 CSM developed the XCP-Gateway for the ECAT MiniModule series and for measurement applications with many measurement channels and high measurement data rates. 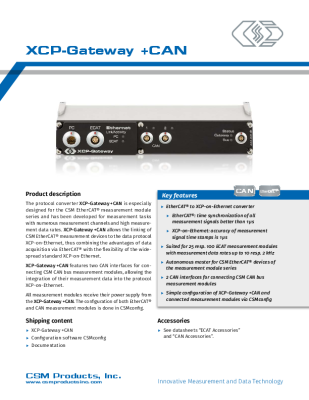 What's more, the XCP-Gateway features two CAN interfaces, thus providing a basis for combined measurement setups with CAN- and EtherCAT®-based measurement modules from CSM. Converter for EtherCAT® to standard protocol XCP-on-Ethernet; combining the advantages of data acquisition via EtherCAT® with the flexibility of the wide-spread standard XCP-on-Ethernet. Numerous XCP-Gateways can be operated over one Ethernet switch.